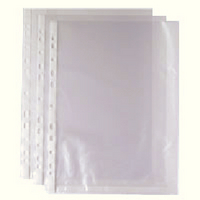 A4 punched pockets keep your documents in perfect condition. Will fit into any standard binder, folder or file. Transparent so you can easily see the document inside. Perfect for storing precious documents such as certificates. Great for display purposes. Approx Dimensions (CM): D31.8 W24 H1. Approx Weight (KG):0.3591.